A prototype for a fully tropicalised Spitfire Mk. Vb Trop, with a prominent Vokes filter beneath the nose as well as other tropical installations. 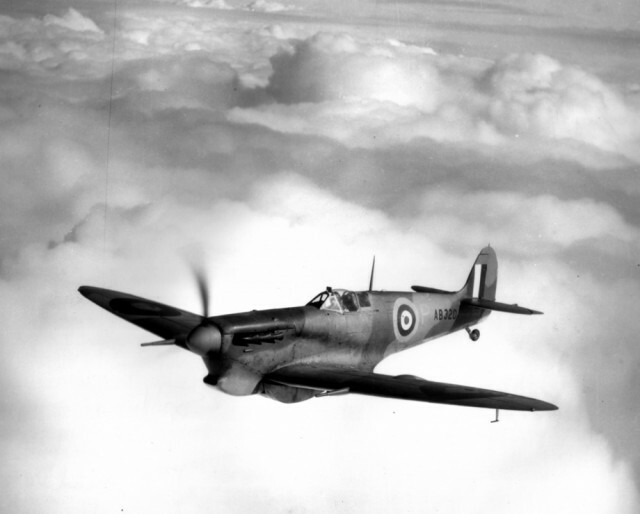 This aircraft, AB320, served as a prototype for a fully tropicalised Spitfire Mk. Vb Trop. Tropical modifications from the standard Mk. Vb included the prominent Vokes filter and housing beneath the nose as well as tropical radiator and oil cooler installations. In addition, various items of desert equipment were carried inside the fuselage. In addition, this aircraft also had a provision for external fuel tank of up to 90 gallon capacity. Of note is also its integral armoured windscreen, usually associated with the Mk. Vc. As the prototype, AB320 was used for various performance trials, starting with comparative tests with similarly equipped Mk. Vc Trop prototype, BP866, in February 1942. Official AAEE trials followed at Boscombe Down during March – April 1942, and the type was approved for service. After successful completion of the tests, production of the tropicalised Mk. Vs commenced quickly. AB320 joined other Spitfires delivered to Africa via Takoradi, arriving in Egypt in December 1942. Four months later, on 27 April 1943, it suffered an engine failure over Gulf of Hamamet. The pilot executed a successful force landing, albeit in an area from which the aircraft could not be easily recovered. It was abandoned in the desert. What I miss though are performance figures, which were notably inferior to non-tropicalized Mark V Spitfires.